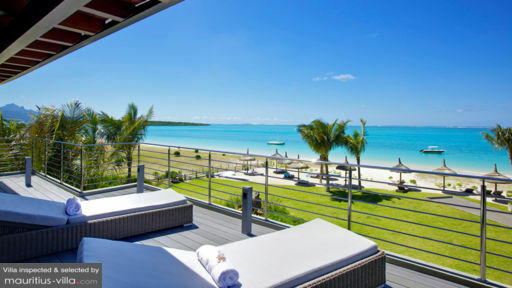 With a stunning view of the azure lagoon of Pointe d’Esny in the south-eastern part of Mauritius, Paradise Beach Penthouse is one of the best places in Mauritius where you can enjoy panoramic views of the lagoon. Indeed, this particular establishment is found in a tranquil neighborhood which is known for being sunny all year long. Because it places you so close to the ocean, this villa offers the perfect setting for visitors who want to indulge in different types of nautical activities such as snorkeling and glass bottom. In this penthouse, you’ll find four airy bedrooms that overlook the beach or the garden. In the master bedroom, you’ll find a King-sized bed, as well as an en-suite bathroom with sink, shower and toilet. In the master bedroom, there’s also a spacious closet as well as a safe where you will be able to stow your valuables during the entire length of your vacation. The other three guest bedrooms come with queen-sized and twin beds. In the complex of Paradise Beach Penthouse, you will be able to make full use of a shared pool where you can splash about to your heart’s content. In the beautifully landscaped tropical garden, you’ll also find sun loungers where you can lazily lounge back with your favorite drink and a good book as you soak in that deliciously warm island sun. The parking area is entirely secure since there is a 24-hour guard who is there to ensure your safety. With French bowls area, pool loungers and even a deck area, the penthouse also comes with a balcony overlooking the beach. This particular villa comes with no less than four bedrooms, which can very comfortably sleep up to eight people. 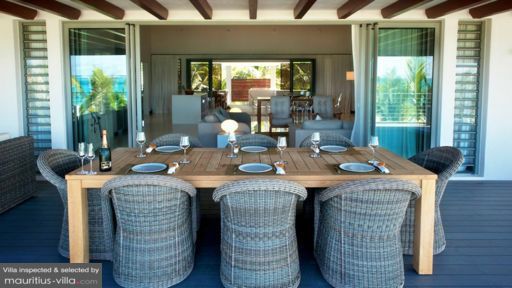 This is the perfect villa for larger group holidays with your friends and family. With 286m² of generous living space, this penthouse comes with a spacious living room enhanced by a flat-screen television, complete with English and French channels. In the living areas, you’ll also find a dining room as well as a perfectly equipped kitchen, complete with fridge, freezer, gas stove, electronic oven, microwave, coffee maker as well as different types of utensils to help you easily prepare your own meals. With WiFi all over the penthouse and Bose iPod docking stations, guests can count on a wide range of services that will help make their vacation in Mauritius even more enjoyable. At an extra cost, you can even receive a welcome pack with an assortment of teas, coffees, butter, yogurt, cereals, jam, bread, local beer, fruit juice, coconut water, milk, mineral water and even tropical fruits. If you want, you can even pay for a daily breakfast delivery as well as your grocery delivery. The resort manager is always on site and at the concierge, you will be able to book different activities and excursions. A housekeeper will also show up on a regular basis to take care of the cleaning, hence ensuring that you have an entirely relaxing time. 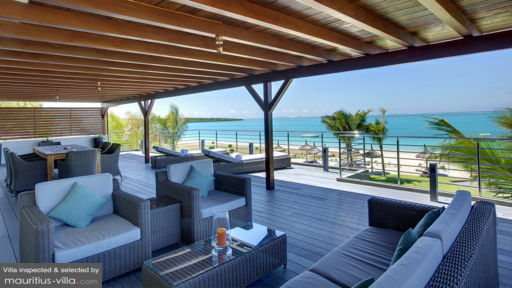 Paradise Beach Penthouse is found near the sunny coastal village of Mahebourg, which is particularly known for its markets and world-famous Mahebourg waterfront, where you will find an assortment of shops and restaurants. This is the ideal place where you can sit and relax in front of the ocean on a warm tropical afternoon as you bask in the glorious Mauritian sun.